Saturday, January 7, will remain evergreen in the memory of Nigeria Professional Football League legend, Victor Ezeji, as he entered the history books as the first player from the domestic league to end his football career with a Testimonial Match after announcing his retirement. Fondly called “VickyMoore’, Ezeji’s swansong was at the Sharks Stadium, where he started his career, in 1996. It was an emotional day for the former captain of Sharks and defunct Dolphins who retired from the game that brought him fame and money, last year. From the up-and-coming youngster of 1996, the stadium was loaded with fans who came to see the veteran bowing out, in 2017. Ezeji attained a record 20 seasons, all in the topflight and received a hero’s welcome from the appreciative crowd. And for the fans, it was also a special day as it marked the first time a high profile match will return to the stadium after previous occupants, Sharks, were merged with rivals, Dolphins, to form Rivers United. Dignitaries at the stadium included Rivers State Commissioner for Sports, Hon. Boma Iyaye, who represented the Executive Governor of Rivers State, Barrister Nyesom Wike, former Nigerian International, Chief Adokiye Amaesimaka, Nigeria Football Federation board member, Christopher Green, former Super Eagles coaches, Monday Sinclair and Augustine Eguavoen amongst others. 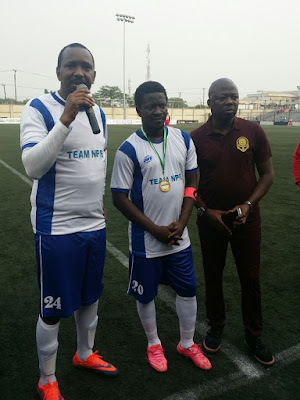 Also at the stadium were former Super Eagles midfielder and now Country Manager, La Liga, Mutiu Adepoju, Atlanta ’96 Olympian, Mobi Oparaku, former Under17 coach, Alphonsus Dike, Rangers Technical Adviser, Imama Amakapabo, Chairman Club Owners Association, Barrister Isaac Danladi, Rivers United gaffer, Stanley Eguma, Rivers State House of Assemble member, Honourable Kelechi Wogu, and President, Rotary Club, Port-Harcourt South, Sir Igo Azubuike. Ezeji started the match with Team Ezeji and switched to Team NPFL in the second half. Before switching to Team NPFL, Ezeji had an exciting combination with former teammate, Emmanuel Ebiede. Interestingly, Dikko, who captained Team NPFL scored the curtain raiser in the first half, while Ezeji increased the tally for Team NPFL in the second half. Ezeji received awards from two of his former teams, Enyimba and Heartland as well as La Liga. In recognition of his contribution to the league, Ezeji was appointed as a Player Advisor for the NPFL. There was a standing ovation when Ezeji was substituted in the second half and he proceeded to watch the remainder of the game on the bench, his work complete. And after the full-time whistle sounded, he headed onto the field to pay his tributes. It has been a special era for himself, fans who came from different parts of the state and of course the planning committee. “VickyMoore” was again rang around the stadium.